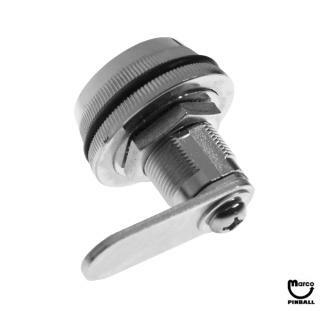 "Lock and cam - 7/8 inch combination " has been added to your cart. Standard 7/8 inch long chrome finish barrel lock with 3 digit adjustable combination. Fits most metal coin doors. No more fumbling or searching for lost keys. Includes 1 inch cam, cam screw, and mounting nut. Combination may be easily set to any 3 numbers you wish by inserting a paper clip into the programming hole. Factory default setting is 0-0-0. Step 1. Set the combination to the number that opens the cabinet locks. Factory default is 0-0-0. Step 2. Push the change button in (located on bottom of the lock) with a paperclip while setting a new combination. Step 3. Release pressure on the change button by removing paper clip. Change your combination any time and as often as you want.